I have a new engine and it came without an EGT tap. What is the rule of thumb for EGT placement? I'd contact the manufacturer and get their specs for placement. I don't think there is a standard location for all engines. 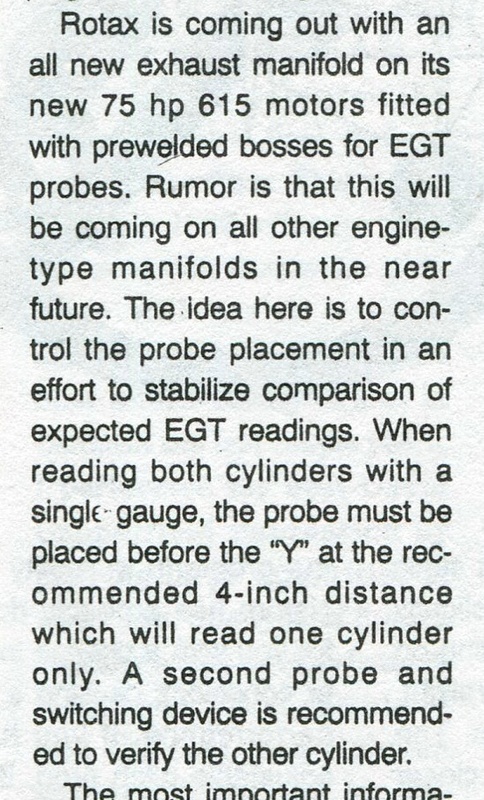 Digging into the 2005 CPS catalog, on page 86 of their Rotax Info pages, I found this info on EGT probes starting at the bottom of the 2nd column and getting pertinent in the middle of the center column, and if I read it right (?) the probe ought to be 4 inches from the piston wall. The 2nd image is a blowup of the pertinent section. FWIW, I went out to the hangar and the factory installed EGT bosses on the 582 are 1 5/8" away from the end of the exhaust port flanges, which would probably put them 4" out from the piston wall, so that agrees. As Beauford used to say; "Worth what ye paid fer it." I miss him.